Edmonton, Canada’s sixth largest city, is number one in North America for average hours worked and vocational truck sales. It’s also number three in the province of Alberta in per capita infrastructure expenditure. That’s why Edmonton is one of Freightliner Trucks’ 2016 Hardest Working Cities. The city was honored on June 22nd in the heart of downtown Edmonton. The award presentation took place adjacent to the construction site of the new, highly anticipated Edmonton Ice District, Canada’s largest mixed-use sports and entertainment district. It will be the new home of the Edmonton Oilers starting this fall and is the first National Hockey League facility in Canada designed to meet LEED Silver Standards. Councilor Bev Esslinger and Glen Vanstone, VP Trade and Investment, Edmonton Economic Development, spoke at the event. 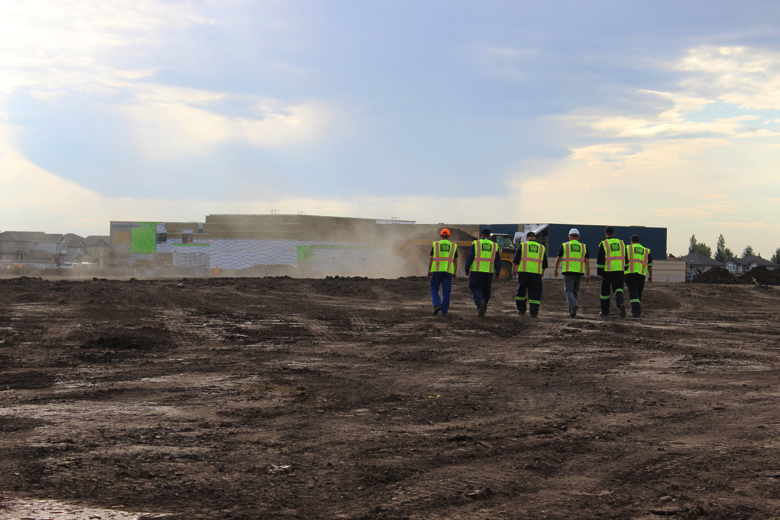 The day before the event, Freightliner teamed up with First Truck Centre and visited three job sites in Edmonton. They came bearing gifts of Hardest Working Cities safety vests, koozies, hats, and the Canadian Brewhouse Food Truck to thank workers and learn a little bit more about what they do. The first stop was a school construction project by DeFord Contracting. The second stop was with mixed use development by M.A.P., and the final stop was a road construction project by ICON Ready Mix. See more stories from workers in Freightliner Trucks Hardest Working Cities on our blog, Behind the Hard Hat. Sisters Robyn Rollison and Ashley Smith taking a break at M.A.P. in Edmonton.